This selection of Conqueror envelopes is designed to perfectly complement the range of Conqueror laid, wove and CX22 paper. Using envelopes that come in the same finish as the paper will help add a touch of professionalism to your correspondence. Envelopes are available in a choice of C5, C6 and DL sizes, and a variety of colours, as well as window or no window options for addresses. 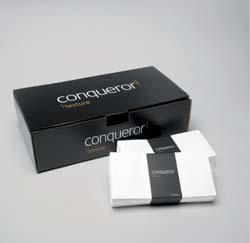 These Conqueror envelopes feature a superseal system for quick and easy use when numerous letters may need writing. To give that great first impression, look no further than Conqueror paper and envelopes for your professional, and personal communications.